Rock star Chris de Burgh is selling a major part of his wine collection because he cannot bear to drink such venerable bottles. The singer – one of whose most famous tracks is 1986’s The Lady in Red – is a major wine collector, his cellar containing such classics as a case of Lafite 1945 and Latour 61, Mouton 82, Cheval Blanc 78, Margaux, La Mission Haut Brion 61 and other greats. 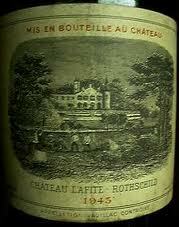 He has a complete collection of Mouton vintages from 1945, many of those in magnum, which he adds to every vintage. Now de Burgh – who stresses he collects to drink, not for investment – has decided it’s time to sell many of the jewels of his collection, such as the Latour and the Lafite.